A home treadmill can be a great way to kick off your resolution to work out more in the new year. (WXYZ) — If exercising more in the new year means hitting the home treadmill regularly, take note. Thousands of treadmill-related injuries land people in the ER every year. Many people neer consider the dangerous surrounding them. In all, about 22,000 people end up in the emergency room because of injuries they sustained on the treadmill. 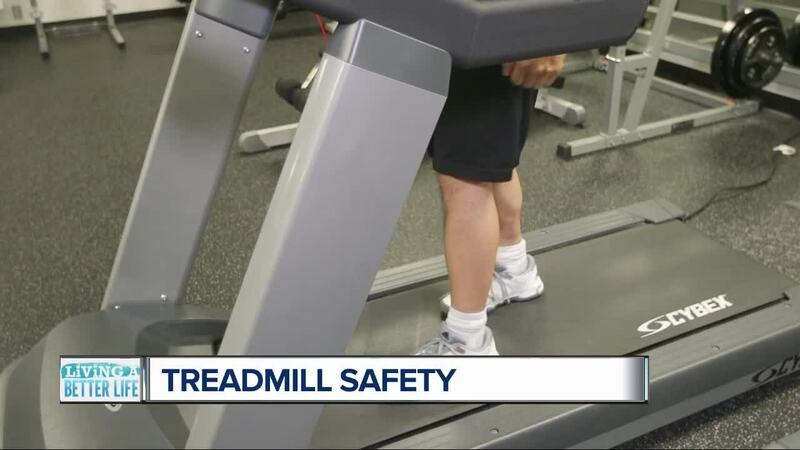 Consumer reports says there are some fairly simple but important precautions to take if you've got a treadmill in your home. “It’s not a good idea to position a treadmill right up against a wall, if you fall and the treadmill belt continues to turn, you’ll get wedged in between the wall and the treadmill. What you need to do is keep a couple of feet on either side of the treadmill and then at least 6 feet behind it. So if you do fall, there’s a space for you to escape," Peter Anzalone, a safety expert for Consumer Reports, said. Also, never allow kids near a treadmill, even when you're on it. But the best protection is the safety key. If the safety key isn't in the machine, it won't start. If you don't want your kids to get hurt, put the key somewhere they won't find it. Other safety tips include straddling the belt until it starts so you don't get knocked off your feet. Keep your head up while moving, and always use the safety clip. Consumer Reports also says good maintenance can be another key to safety. Keep the running belt aligned, the deck under the belt properly lubricated, tighten loose hardware and wipe up any sweat –– especially on the hand grips and controls –– every time you use it.